In an ideal world, a motorhome would be 100% enjoyment. Unfortunately though, there are those whose actions will always spoil such a scenario. True, they are a very small minority. And luckily, there are plenty of steps you can take to lessen the possibility of becoming a victim of motorhome crime. It’s all about being a bit wary. Just remember, you might be on holiday, but criminals aren’t. In fact in 2014 Caravan Guard saw theft related motorhome insurance claims increase by 35%, so it’s certainly worth keeping up your guard. There are lots of ways you can make your motorhome less welcoming to motorhome break-in. 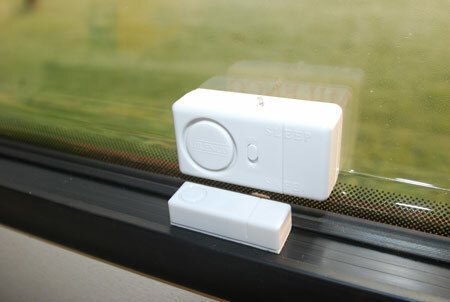 There’s also a new wave of combined alarms/immobilisers/trackers on their way, operable via an app on your Smartphone. Consider, also, details like a safe that can be tucked away securely in your vehicle. Ideal for the secure storage of anything from passports to spare mobile phones and credit cards, as well as vital documentation, you just need to make sure the safe itself has a secure fixing, in a place that’s not too logical for a thief to get at, and – just as critically – in a location where you can access it. You might also want to add further locks, for example for bikes, the generator etc. The dealer that you purchased your motorhome from should also be able to offer advice on additional security, but if you’re in the process of ordering a new motorhome, you’ll get a better deal if you negotiate for such items as factory-fitted extras. It needn’t cost much to add extra security, and give yourself a whole lot more peace of mind. The key is with a lot of such items, they also act as a visual deterrent, and will certainly hamper a thief’s progress. Alarms and tracking systems, subject to approval, will ensure a discount on your annual policy premium. 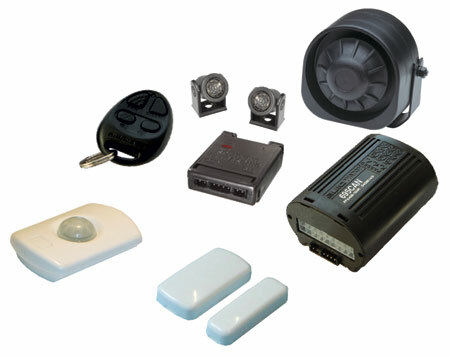 See also our motorhome security and motorhome tracking sections. There are all kinds of other devices – from steering wheel locks to various locking devices for individual pieces of kit (alloy wheels, catalytic converters etc), to extra locks for doors as well as windows – that you can add to show thieves you mean business. One key theme here is, if a thief sees a fully protected motorhome, he/she will most likely move on to one that’s potentially an easier target. Be careful where you park your motorhome. It’s always best to be seen, but also worth ensuring you park where the habitation door is easily noticed, rather than hidden away. If you can, avoid poorly lit areas at night. Popular holiday resorts often have higher than average levels of crime. Be extra vigilant at such places. Make friends with your neighbours, whether you’re on a campsite, a French aire, or even just parked up beside a beach. They’ll keep a lookout for you, as well as vice-versa. Don’t tempt thieves by leaving high-value items (eg TVs) on view. It’s well worth making a list of all the items of value you keep in your motorhome. Write down any distinguishing features, especially damage marks etc., that will make them instantly recognisable as yours. You might also want to keep photos of such items and/or use permanent ink to mark anything as yours. Although you’ll possibly get away with a normal car alarm on a campervan, it’s usually worth investing in a system that’s purpose-designed for motorhome use. Electronic theft is the current trend. Thieves will target the stealing or cloning of motorhome keys for access to vehicles which they can simply drive away. That’s why many suppliers are now combining alarms with trackers and more. Look out, especially, for products from the likes of Van Bitz, Phantom and more – remember, also, there are degrees of bespokeness with motorhome-specific products that mean you can tailor them to suit your particular needs. Such products may also have features such as perimeter protection, sleep mode (for when you’re in the vehicle), pet setting and the facility to add extras like bike locks. Some systems can also be transferable to your next motorhome. Several motorhome insurance specialists will reward fitment of a Thatcham Category 1 approved alarm system with discounts. Indeed from a Caravan Guard point of view you’ll get 19% off your premium. It’s also worth bearing in mind if your motorhome reaches a certain value your insurer may make it compulsory to fit extra security such as an alarm. In these cases it’s likely they will demand a system that carries Thatcham Category 1 approval. Just remember, also, it’s not just about the actual cost of replacing any stolen items, some of the stuff on board your motorhome may well have a high sentimental value – and no insurance company in the world can help with replacing that! Motorhome insurance specialists including Caravan Guard will generally only recognise alarm systems that are Thatcham Category 1 approved or Thatcham 2 to 1 approved (2 to 1 devices are aftermarket alarm upgrades that link to a base vehicle’s existing engine immobiliser). Here’s a great example of a typical Thatcham Category 2 to 1 approved alarm that can be retrofitted to most motorhomes, from a company that’s notched up a quarter of a century’s experience supplying such vehicles. It’s a remote control alarm system that operates in conjunction with the base vehicle’s remote central locking fob. It also comes with an additional remote control, plus contacts for the habitation door and external lockers and intelligent battery back-up siren. A PIR sensor is fitted in the living quarters, with ultrasonic sensors in the cab. A pager and/or tracker can also be added. Expect to pay around £300, with fitting in the region of £120-£150. Contact www.rammobile.com or speak to your dealership about equivalent devices they can supply. Caravan Guard give a 19% insurance discount to motorhome owners who have a Thatcham CAT 1 or Thatcham 2-1 upgrade alarm system fitted. Just to show you don’t have to spend a fortune to enhance the security of your motorhome, these typically retail at around £30. It’s a set of six individual window alarms that comprise flashing LEDs as well as an audio warning, should anyone attempt to open any window to which they’re attached – they work best on typical double-glazed units on coachbuilt motorhomes. Fitting couldn’t be simpler – they use compact adhesive – and each comes with its own switch and a battery (supplied) that will last for up to 1,000 hours. They’re so easy to fit, too. Designed for the kind of double-glazed acrylic windows you get on a typical coachbuilt, which means they’re also highly visual. Milenco also supplies a number of specialist internal and external door locks, and more. Many of these products may not gain you a saving on your motorhome insurance premium but they will give added peace of mind whilst staying in the motorhome. This won’t prevent the theft of items (although, again, the labels are an initial visual deterrent), but it could prove invaluable in their subsequent recovery. Smartwater is a highly permanent marking system, where markings can only be seen under UV light. They comprise of a unique code that you can put on almost anything that could be removed from your vehicle – from stereo head unit to furniture, as well as TVs, etc. With each kit you get 10ml of marking solution, two outdoor labels, three window labels, six round tamper-evident labels, two oval external labels (for adding to items such as accompanying bikes etc), registration form and application instructions. Expect to pay around £72. This interesting new product was unveiled at September’s Caravan Salon exhibition in Germany – and there’s a chance it might come to the UK. 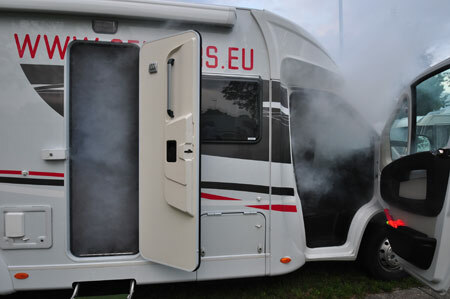 It’s from a company called Sensers and it prevents theft by literally filling your motorhome with dense, non-toxic, non-marking, odourless smoke, should anyone break in to try and steal anything. It’s already on sale on mainland Europe, at around 1,000 euros. Easy to fit, the kit comprises two remote controls, two magnetic contacts (plus, you can buy up to 40) and a smoke machine with cartridges. It draws no power when not in use. It takes anything between 10-15 minutes to disperse the smoke by opening doors and windows. However, if a thief attempts to get back in, the whole process starts again. Find out more at www.sensers.eu. Got any hints and tips you’d like to pass on to fellow motorhome owners regarding securing your motorome and preventing break-ins? Please add a comment below. Details correct at time of publication but may be subject to change. I agree with you regarding security of your motor home most owners don’t do anything until it is too late, I have had Yale locks fitted to the two front doors of my vehicle cost £150 and fitted my own on the side door, plus a Thatchem steering wheel cover cost £95 well worth the expense. Thanks for posting your idea Clive and it’s one we’ve shared with the National Vehicle Crime Intelligence Service in the past. It seems that roof markings do have their place but would probably only offer a minimal increase in theft recovery. If there became an industry standard number format and database, and then this was linked into the ANPR (automatic number plate recognition) system on our roads, roof markings could have some real value.